Old Bangkok photos feature a set of very old pictures taken by a visitor to Bangkok in 1959. Many of these images of Bangkok will remain as just memories. Others have endured the test of time. Back in 1959, Vic Plant of North Carolina USA was in the US Navy when he first visited Thailand on board the USS Maury on a survey mission. Vic was a mechanic with the Seabees, the Construction Battalions of the US Navy. He repaired and maintained gasoline and diesel equipment and at times operated some heavy equipment. When his ship docked on the Chao Phraya River, Vic snapped this photo. This was the first of the old Bangkok photos that Vic sent to me. The photo came together with this story. 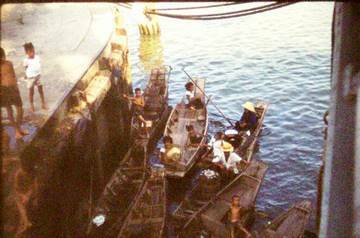 These old Bangkok photos were taken when I was in the US Navy and my ship had a tour of duty in Thailand. The ship docked at Bangkok on the river. I took a photo of a native boat under sail and I am trying to find out the name of the type boat. Could you tell me what it is? This seemingly straight forward request sparked off an informative and interesting search that involved a Thai and two other Americans, all of whom are living in Thailand. As I knew next to nothing about sailing boats, I e-mailed another visitor to my website, Piyawee Ruenjinda who got in touch with Steve Van Beek. Steve in turn sought the second opinion of another American, Bob Stevens. Twenty years ago, Steve Van Beek, rowed for 58 days in a small teak canoe from the headwaters of the Chao Phraya River in northern Thailand, down Ping River in Chiang Mai, joined up to the Chao Phraya in Nakhon Sawan, on to Bangkok and the Gulf of Thailand. Steve’s journey covered the northern and central regions of Thailand, a distance of more than 700 km (more than 435 miles)! June 2008 is the 20th anniversary of his expedition which is covered in his book, “Slithering South”. Bob Stevens has sailed the seas in this region. Not only is he familiar with the boats in the area, he knows the owners as well. The comments below speak for Bob’s knowledge of boats in the region. I reprint with the permission of these two men, their relevant comments, verbatim. This is what Steve had to say. 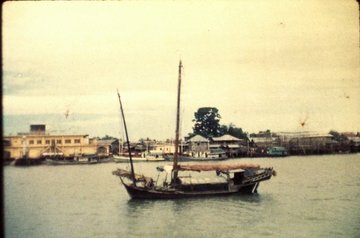 From the rigging and the sail shape, I'm guessing that this was a Chinese coastal junk that plied both coasts (Gulf and Andaman) southward to Singapore. 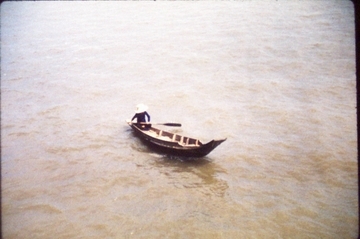 The "June Batra", was one of many that, when the present owners bought it in the 80s, was carrying charcoal made from mangrove wood down the Andaman coast for sale in Penang, Kuala Lumpur, and Singapore. It definitely is not a Thai boat and the deck line is not close enough to the water to be a Vietnamese junk. Steve contacted Bob and got more. A few minutes after sending off the previous e-mail, I got a brain flash and telephoned an old friend, Bob Stevens, who used to build yachts near Praphadaeng and now lives in Lamphang. He said that there were about five boats, all junks and all with Chinese owners, that carried rocks from Koh Si Chang (the old customs port) in the Gulf of Siam, up to Samut Prakarn (Paknam) where they were crushed for construction purposes and sold in Bangkok. He bought one of them 48 years ago and converted it into a ketch which he sailed to Sri Lanka. I am sending him your photo for further details and will get back to you when I receive an answer. Bob added more gems after he saw the photo. 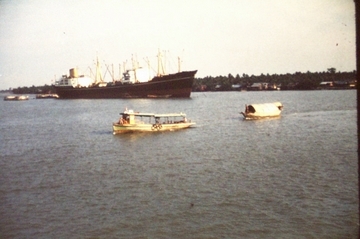 The lines and rig of that junk are unmistakable; it is one of the old cargo junks from Paknam. This one is obviously no longer hauling rock from Ko Si Chang. It has been partially re-built. The aft cargo hold has had a cabin trunk built over it, and the forward cargo hold has been decked over. Probably sold to some farang who has turned it into his private yacht. I used to know every one of the old junk owners and captains in Paknam, but they were all older than me, and I am now 80, so probably they are all dead by now. They were some of the best sailors I have ever known. Tacking a junk up-stream against the current in the river required a great deal of skill and patience. Bob's reply is interesting since, unless it has been antiqued by applying a sepia tone to it, it is an old photo, which would negate the comment about a farang having turned it into his private yacht because that means it would be of more recent vintage. No problem; I think we have solved your mystery. Farang is the term Thais call all Caucasians. The word also means the guava fruit. The Thai word for France is farangset. The term isn’t derogatory in any way. Long time resident farangs in Thailand refer to themselves that way too, as Bob and Steve have done. I don’t know how the word came about. The French weren’t the first Europeans in Thailand. It was the Portuguese in 1511. The French came after. Update on the term "farang"
Here is a possible explanation on the origins of the word "farang". The word is derived from the Arabic word, "al firinjah" for the Franks from ancient Gaul (present day France). The Muslim world’s early contact with the Franks was not a pleasant one; it was during the First Crusade (1096 - 1099) when the Crusaders recaptured Jerusalem in July 1099 and massacred the inhabitants regardless of religion. The term was later used for all the European Crusaders whether they were Franks or not. Later when Arabs traders came to Ayutthaya and encountered Europeans, most likely Portuguese, they called the Portuguese "al firinjah" as well. In time the name applied to all the other Europeans in Siam. A variation of the Arabic term for Europeans is "ifarangi". It’s interesting to note the same term in other languages; frangos (Greek), ifrangi (Turkish), ferangi (Persian), feranghi (Hindi), farengi (Tamil). 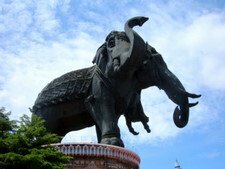 As there were Persians and Tamil Indians in old Siam, they could also be a source of influence. So there you have it; whatever it is, it has nothing to do with the guava fruit which is also called "farang". Vic has vouched for the authenticity of these old Bangkok photos. I refer to that picture, it was said that the picture may have been touched up like changing it to a sepia finish. The picture is original and has not been touched. It was shot with a 35mm film camera and made into a slide. I put the picture onto a screen and took a digital picture. I believe most of the slides have gotten darker. Some are even getting black marks on them. Remember they are 50 years old which is almost as old as me. I think I am changing color and getting black spots. Ha! The old Bangkok photos submitted by Vic have not been touched up by me either. The only change I made was to reduce their sizes proportionately for easy downloading. I didn’t crop any part of these photos. 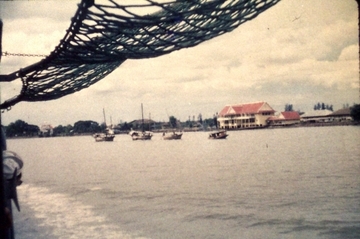 As the USS Maury entered the Chao Phraya, Vic captured these scenes. Vic grew up in the beach community in New York and has been in all kinds of boats as a boy, hence his love for boats. 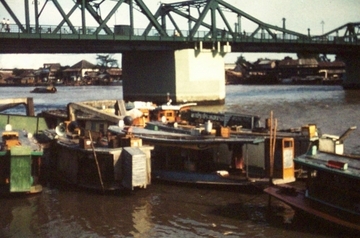 These old river settlements on the Chao Phraya might still be there, not this type of boats though. 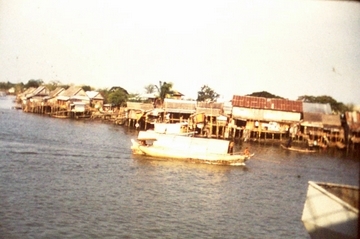 Life on the Chao Phraya then was idyllic unlike the hectic river traffic today. 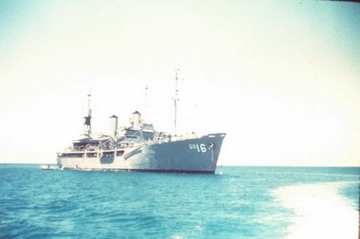 When the USS Maury finally docked, many small boats came alongside. 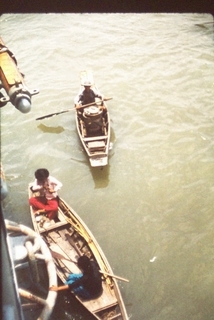 Some were boat vendors, others had children waiting for candy and coins. Vic took these old Bangkok photos. The rowing boats with the old round stove looks like they’re selling something hot, boats noodles (kway teow ruea)? In 2005, I spotted a similar boat selling noodles to the river communities in Nonthaburi, just north of Bangkok. I wonder where all these boys are now. They must be in their late 50s or early 60s today! 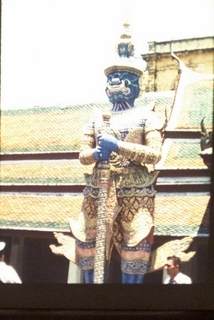 On shore leave, Vic toured Bangkok with a shipmate. He had pleasant memories of the trip, added more old Bangkok photos and had this story. I can just imagine what Bangkok looks like now. Did things change there since I was there? Ha! I remember a shipmate and I got a cab by the ship one morning and he took us around the city to different places. He couldn't speak English, so it was all hand signals. He was a great guy and when the ride was over we tried to ask him how much for the trip. He pointed to my pack of cigarettes and that was all he wanted. Gas wasn't 4.50 a gallon then either. 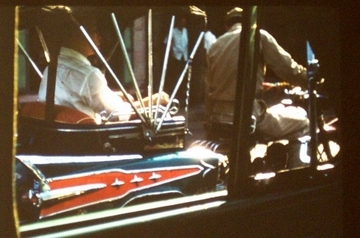 This was probably before the famous “tuk tuk” hit the streets of Bangkok. The scenes below look very much like the grounds of the Grand Palace and the Temple of the Emerald Buddha. 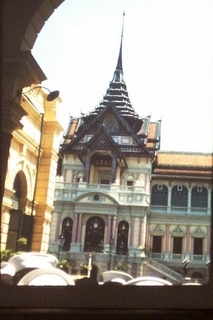 This is the Chakri Maha Prasat Hall in the Grand Palace with its characteristic multi-tiered gables and spires. The right staircase leading up to the balcony is shown, the left staircase isn’t in the picture. On 13 June 2006, 25 kings and queens, princes and princesses were royal guests here for a state banquet to celebrate the 60th anniversary of His Majesty's reign. 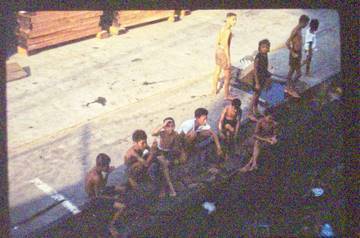 Some of the images in these old Bangkok photos are still there, others are long gone, just distant memories. Vic closes with these touching words to the people of Thailand. I hope that you find these pictures interesting as I enjoyed taking them. Those were some great days and I appreciated having the opportunity to visit your country. All the people that I came in contact with were warm and friendly and even though it is not possible to do so, I would love to make a trip back to that river and dock and see how it is today. As I stand on the dock I will close my eyes and see what it was in 1959. What a long time ago. If anyone there in Bangkok remembers the USS Maury AGS 16, I want to say hello and thank you for letting me share a moment of time in your country. 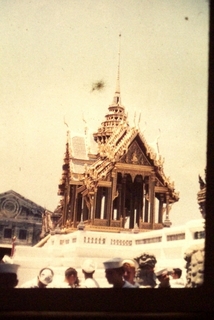 I wish to express my sincere thanks to Vic Plant for sharing with us these old Bangkok photos and the wonderful memories of his visit to the city in 1959. The images of old Bangkok are really treasures to be preserved. A big thank you must also go to Piyawee Ruenjinda, Steve Van Beek and Bob Stevens for their expertise in sailing boats in the region. Without their valuable inputs, this article just wouldn’t be complete. Vic Plant passed away peacefully at 2:00 am 4 February 2011 EST in North Carolina USA at the age of 74. 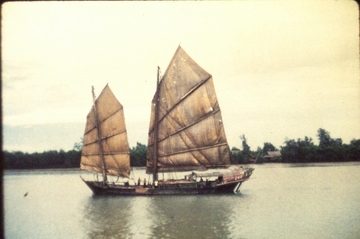 I first got to know Vic in June 2008 when he sent me the photo of the Chinese junk taken on his first visit to Thailand in 1959 and asked me to help identify it. 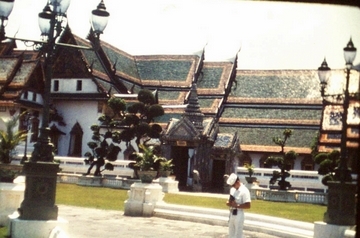 I had to ask around; Vic sent me more old Bangkok photos and a story. We put our heads together and came out with this page which you have just read. Since then we became close friends online though we never met. Despite his age and physical limitations, Vic was active on the internet and a keen photographer. 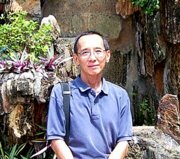 He frequently took photos, downloaded them and sent them to me, proof that we are never too old to learn and be active. On 29 January 2011, I received the sad news from Kenneth, Vic’s son. Vic had a stroke earlier in the week and went into a coma. He never recovered. Thank you Vic, for your friendship and encouragement, I will do just that. Rest in peace in the place that has been kept for you. My condolences and sympathies to Kenneth, his son and the rest of his family. May they find their comfort and peace during this difficult period. 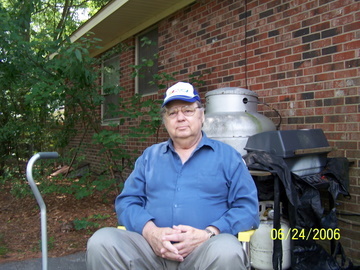 On 9 February 2011 at 11:00 am EST, a memorial service was held for Vic Plant at Evergreen Baptist 9626 NC Hwy 210 South, Autryville NC, after which he was buried at the church cemetery. The service was attended by family members and close friends.